MyThreeCats.com goes follow url beyond being an on line specialty cat boutique. Over the years, since the beginning of our business in 1998, we’ve helped advance the initiatives of numerous cat shelters and cat rescue organizations, as our resources permit. You can help us continue the effort. 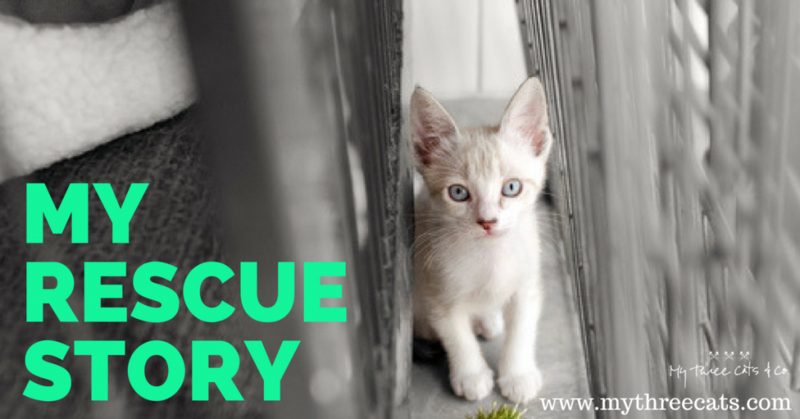 We invite you to post your favorite cat rescue story (perhaps your own personal cat rescue story?) on our Tramadol Cheapest Facebook site, now through Friday, August 11th. Then shop now through August 11th at MyThreeCats.com and we’ll donate 5% of sales proceeds to Alley Cat Allies. Alley Cat Allies is a non-profit organization advocating the humane treatment of all cats. Tramadol 200Mg Online A sincere thank you from us and of course, the cats. Guest Blogger: see Jessica Brody –http://www.ourbestfriends.pet. Jessica enjoys writing about cats and dogs. See her blog for additional photos and posts). A cat is a great pet who can be just as loving a companion as a dog. It’s important to know, however, that cats are not dogs. They react differently to situations, learn and “train” differently, and require differing approaches to care. Here are some tips for being a great cat owner. Cats are carnivores, plain and simple. You can’t feed your cat a vegan diet and expect it to stay healthy. “Money saved by buying cheap cat food will be spent hundreds of times over on veterinary care. Cats are obligate carnivores and need a good source of meat protein. They do not need large amounts of grain fillers, especially corn, which is a cheap source of protein used by many cat food manufacturer,” notes The Spruce.com. Check your cat’s stool. If it appears too dry, you might want to switch to a wet food diet for a while or at least alternate between wet and dry food throughout the week. And remember – don’t feed your cat milk, despite what all of the cartoons say. It can be harmful to them in many cases. It’s a myth that cats don’t need exercise. Sure, they don’t need as much as a dog – but cats that don’t exercise can develop a bevy of health problems, including heart disease and obesity. … How do you ensure that your cat is getting enough exercise? The best way is to simply play with them for 15-30 minutes. If you have a fenced-in backyard, let them run around for a while. Make use of laser pointers. Your cat really will chase them for a long time. If your cat is suffering from obesity…talk to your vet about this more extreme exercise plan. Cats will scratch. Like death and taxes, it’s a certainty of life. Make sure your cat has plenty of scratching posts to utilize. Never ever consider declawing a cat, even if they live indoors 100% of the time. It’s inhumane. One of the biggest challenges cat owners face is making sure the cat gets along with the other household pets – usually a dog. It’s important to remember that dogs and cats socialize in different ways, so “training” your cat the same way you trained your dog is not likely to have an effect on their behavior. What you need to do is be mindful of the energy of the animals in your household. “It’s your responsibility to keep the family balanced by keeping the dog at the highest level of calm-submissive behavior, allowing the cats to become calm-assertive in front of him,” notes famed trainer Cesar Millan. If your cats are showing aggression toward each other, it’s a different story with a different set of solutions. First, you should never let cats work through their issues with fighting. It just doesn’t work like that for them. “Never let the cats ‘fight it out.’ Cats don’t resolve their issues through fighting, and the fighting usually just gets worse. Interrupt aggression with a loud clap of your hands or spray from a water gun,” says the ASPCA. Once you separate your cats just leave them alone. Don’t try to soothe them the way you might try to calm a dog. You can also try to separate your cats’ resources – food, water, and toys. Do your research on proper cat care. 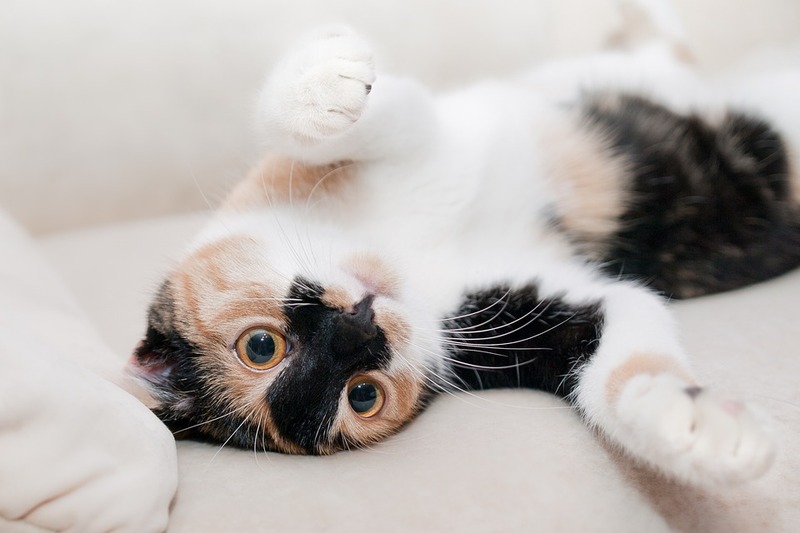 There are a lot of myths out there about cats, and some of them can be harmful. 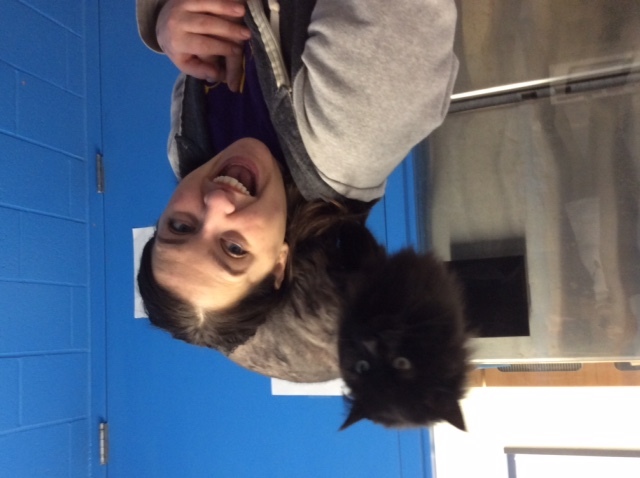 Here’s Jane Marcus, of the Western Pennsylvania Humane Society, pictured with a new shelter cat! Can you tell Jane likes cats? This little guy, whose name is Furlington, has beautiful black fur that was badly matted when he arrived. 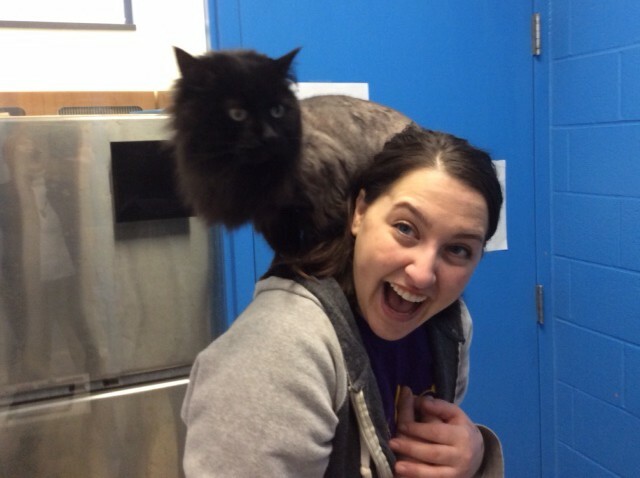 The kind shelter folks shaved him so his fur would grow back and transform him into his natural, handsome self. Furlington is available for adoption now! Celebrate October 29th in a number of great ways. 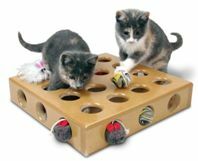 Have some serious quality play time with your own cat! Here’s a video we thought you might like. Enjoy! Posted on October 29, 2015 Categories cat adoption, cat shelter, cat trivia, Funny cat cartoon, Just for FunTags cat adoption, cat day, cat fun, cat play, cat trivia, cat videoLeave a comment on It’s National Cat Day!